Easy Cash Concepts SCAM - Review exposes the UGLY TRUTH! 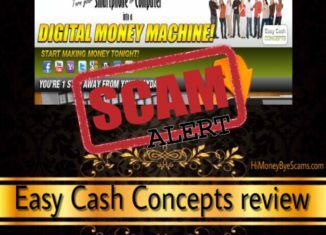 Home > Avoid scams > Easy Cash Concepts SCAM – Review exposes the UGLY TRUTH! Will Easy Cash Concepts scam you out of your hard-earned money? Will it waste your time? Or perhaps you hope that easycashconcepts.com will make you the kind of money that you deserve? First of all, I must congratulate you for taking the time to do your own research before buying into another money-making system. The Internet is full of ugly scams, so it’s great that you’ve done your due diligence because that’s the way to avoid the frauds and find the genuine way to generate an income online! When it comes to Easy Cash Concepts, there’s nothing real about it and this honest review will prove it to you. Here you will find how the full truth about this system, so you will have all the information you need to make an informed decision by the end. 2 What is Easy Cash Concepts about? 3 How does Easy Cash Concepts work? 4 Easy Cash Concepts scam signs revealed! 6 Ready to say bye to the work-from-home scams? What is Easy Cash Concepts about? Easy Cash Concepts sounds like a program that can make it possible for you to make money easily, don’t you agree? Well, that’s what the name sounds like. But when I landed on the easycashconcepts.com website, I started suspecting of it because it looked like another fake news article. No matter where you click, you get taken to another page so there’s no way for easycashconcepts to be a legitimate website. According to the information on the fake article, Jamie Taylor is a work-from-home mom who makes $9,000-$12,000 a month only working 15-18 hours a week. Easy Cash Concepts is said to have changed her life because she found it after losing her job, so she recommends this program to everyone. She supposedly only had to fill out a short form to apply for a work-from-home kit, and 4 weeks later she was already earning $7,000 a month. The companies that she apparently works with are companies like Amazon, Google, Walmart, Apple… This opportunity is said to have been helping work from home for over 5 years. However, the article doesn’t contain any information about how it works. Is this a business? Is this a work-from-home job? The fact that they say this is very easy but don’t reveal what you have to do to make money is an alarming red flag because that’s something very common in scams. Scam websites usually focus on how much money you can earn thanks to their system, but they don’t explain what you’re required to do to make the kind of money they talk about. How does Easy Cash Concepts work? Simply put, Easy Cash Concepts doesn’t work to make you money. It works in a way that benefits the people who are running this program. The purpose they have with the fake news article is to get you to the next page, where they ask you to complete a form with your personal details. The purpose of the news article is to get you in front of the page you can see above. Everything about the news article is fake, even if it looks real. They want you to think it’s a legit news website but you can realize it’s fake when you try to access other sections (finance, tech, media…) and you’re taken to the Easy Cash Concepts page that you can observe in the screenshot above. Then you’re asked to complete the form with your personal information like your name, email address, phone number, address… In my opinion, they’re asking for too much information before telling you what this is really about. I don’t recommend that you use your personal details to fill out that form because you’re not going to get a real opportunity, since Easy Cash Concepts is not legitimate. I actually tried filling out the form to see where I would be taken, but after completing it, nothing happened. So, what do they want if they’re not asking you for any money? Your information. They want to collect as much information as possible and then use it for profit. They will sell it to other companies or scam artists, so you can expect to receive spam emails from them and other scammers. Not only that, they will also call you to try to convince you to give them your credit card information or make some kind of purchase. Giving these con artists your information is more dangerous than it might seem, since they are also putting you at risk of identity theft. Because of this, I don’t recommend that you fill out that form. If you’re curious to see what it would happen, I would suggest that you use some invented details. Easy Cash Concepts scam signs revealed! Both the fake news article and the Easy Cash Concepts page have some scam signs that you need to be aware of, since these scam signs are very common in work-from-home scam websites. One of the biggest red flags is the fact that they claim you can make money easily and quickly. 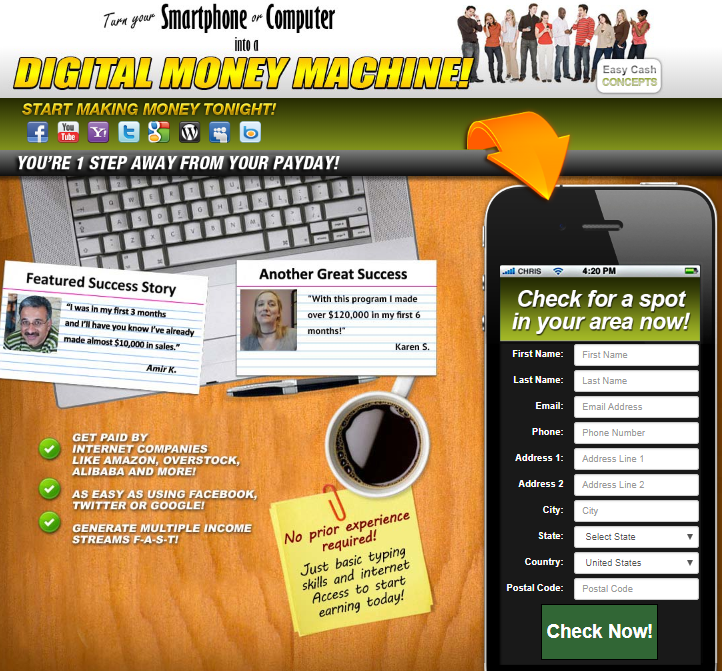 In the Easy Cash Concepts page, they say “start making money tonight”, which makes this opportunity sound like a get-rich-quick scheme. Most programs that make these kind of claims end up underdelivering or being total scams, which is the case here. If earning cash online was easy, don’t you think most people would be doing it? Most people would have already made millions. So don’t be fooled by these con artists who claim you can make an income without doing much work! They’re the ones who want to make money at your expense. In the fake news article, you can read some comments that have apparently been written by people who have tried this program. For example, the comment posted by Ben is invented and Ben is not even a real person who has tried Easy Cash Concepts. His story is totally fake. The picture of “Ben” can be found in different websites, which means that the scammers have basically downloaded that picture and use it to fabricate the fake comment. 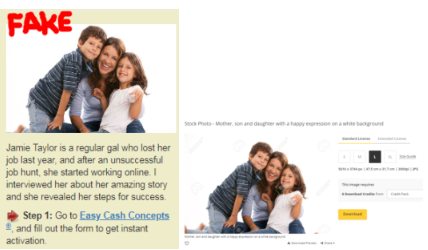 What about the two success stories we can see in the Easy Cash Concepts page? There’s nothing genuine about them! For example, “Amir K.” has supposedly made $10,000 in sales but the truth is that he’s not a real member. The man who appears in that picture has nothing to do with Easy Cash Concepts. Truth be told, the only ones who have benefitted from Easy Cash Concepts are the unethical people who have created it. Easy Cash Concepts has no real positive reviews so no one has made money with it. They wouldn’t have had to fabricate fake success stories if this program was really legit. Who’s behind Easy Cash Concepts? Who has created it? There’s no information about the owners of this program, so how can we trust it? The comments and the testimonials are fake, so is there anything that’s not fake about it? So everything we’re told is basically fake. Is there any way we can trust the people behind Easy Cash Concepts? Not for me. I cannot trust people who are trying to make money by lying and deceiving other people. No way I can trust people who don’t reveal their real identity. Is Easy Cash Concepts a scam? Yes, it’s a total scam. I actually don’t like calling everything a scam because there’s something good in everything. If they actually provided you with some training or something that could help you in some way, I wouldn’t call Easy Cash Concepts a scam. But that’s not the case, they want your personal information for nothing in return, which is unethical and illegal. Another thing I dislike is the fact that they’re making it seem like earning money online is easy or fast, which gives this industry a bad reputation. Because of scam programs like Easy Cash Concepts, newbies have this idea that there must be a push-button system or secret that enables people to make money fast. This is actually harmful because it makes beginners lose hope, so they end up believing that all money-making programs are scams and not trusting a legitimate platform when they see one. Because of everything I have explained, my final verdict is that I don’t recommend Easy Cash Concepts. Ready to say bye to the work-from-home scams? The moment I realized that making a full-time income online required time and effort, I stopped wasting my time on get-rich-quick schemes and other work-from-home scams. I’m thankful that I learned about a proven business model that is newbie-friendly and didn’t hesitate to give it a try. There are lots of ways to make money online, but if your goal is to become financially free, then you need to focus on creating a passive income stream. This business model I use enables me to work from anywhere I want as long as I have a computer and Internet connection and I can also choose my own hours. Not only that, this business also allows me to earn a 4-digit monthly passive income online which is so cool. I’m glad that I didn’t give up the times that nothing seemed to work. Making efforts really pays off at the end! I also have to say that this is not for everyone because not everyone is committed to learning and taking action. And you will also see how you can start today for free! That’s right, you don’t need to spend a dime to make sure that this business is right for you. Your free account will give you access to step-by-step training and tools designed to help you start the proper way. I’m so excited for you to stop wasting your time on scams and start building your future today! I hope this honest Easy Cash Concepts review has been helpful to you and you will make the best possible decision. Click2Sell.co review – Scam or legit advertising platform? TRUTH EXPOSED! Million Dollar Replicator SCAM – Review reveals what no one told you! Is Club 365 a SCAM to avoid? Review exposes 5 RED FLAGS! Insider Profit Groups SCAM – Review reveals 3 RED FLAGS!